Today at SSINKspiration we are CASEing other Design Team Members. CASE stands for Copy And Steal Everything. Today I CASEd Bree and her fun Birthday Boy card. It is appropriate that I CASEd Bree's card today because when I first saw it, I ordered the Starburst Framelit right away. She always gets me to buy new Stampin' Up! items with all of her fun creations! I hope you enjoy my take on her card today. 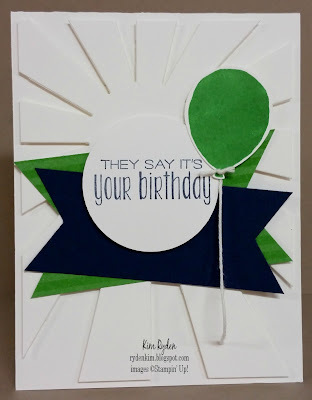 Make sure that you head on over to the SSINKspiration main blog today to see what the other Design Team Members created for you. You won't want to miss them!